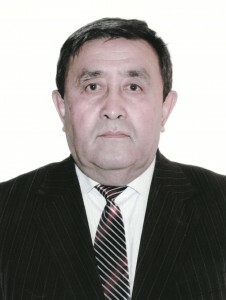 Mazhenov N.A. graduated from department of theoretical physics of KAZGU of a name of Al – Farabi in 1970. Began work the teacher of school in Ayaguze. In 1980 on the Academic Council of the St. Petersburg university defended the dissertation on a rank of the candidate of physical and mathematical sciences. Is a coauthor of the monograph “Fluctuations of Oxide Lattices” “Nau” – 1980 Mazhenov N.A. published manuals “Optics” of-2010 g, “Жараты-лыстанутұжырымдарыныңнегіздері” – 2012 and “Жараты-лыстанутұжырымдарыныңнегіздері”-2004 g. Is the author of four electronic manuals registered in Committee on intellectual property rights of the MU of RK 2008-12. On the instructions of Association of higher educational institutions RK Mazhenov of N.A. as a part of collective translated into a state language the book by I.E. Irodov “Mechanics” – Almaty, 2012. In 2013 he became the coauthor of the translation into a state language of the textbook J. Bird of “Electrical and Electronic Principles and Technolology”, and K. Krane of “Modern Physics”, according to the register of the Ministry of Education and Science of RK. Mazhenov N.A. actively is engaged in scientific activity. Has the scientific articles published in high-rating magazines. It is awarded with the Certificate of honor of Department of Education of the Karaganda region in 2008 for training of pupils on scientific projects. For active work of the translation of textbooks on a state language for the higher educational institutions RK Mazhenov N.A. 2013 it is awarded with the Certificate of honor. In 2014 for fruitful activities for increase in level of knowledge of pupils and teachers of physics the Bayanaulsky department of education expressed to Mazhenov N.A. gratitude.